Mr Park working on his shovel installation. From SAP’s news letter: The English word ‘sap’ has various meanings: it refers to ‘a watery fluid that circulates through a plant’, ‘energy’, ‘vitality’, ‘a deep and narrow trench’ in military terms. In the Korean Language dictionary, ‘sap’ refers to a utensil used for a religious service to ward off suffering, misfortunes, and devil spirits and a tool for digging the earth. 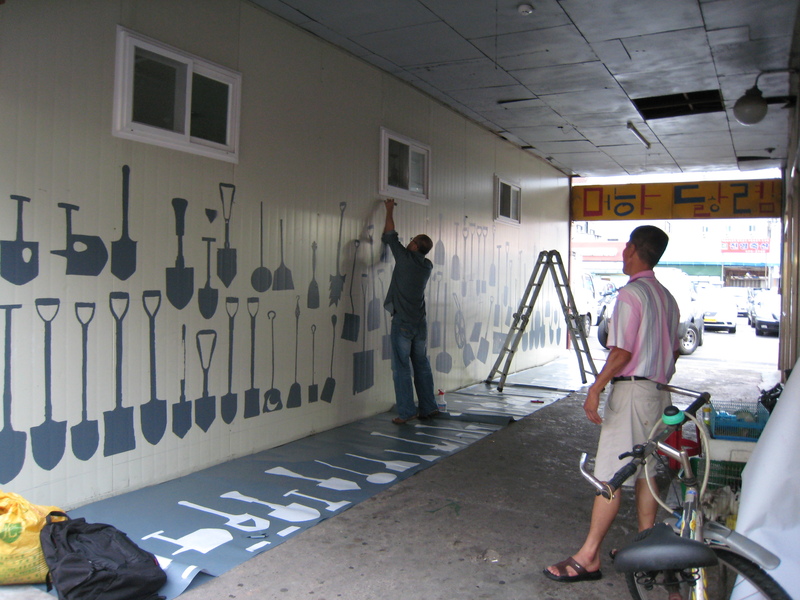 As a verb, it connotes ‘to put into,’ ‘to insert, piece’, ‘to intervene’, and to break into’….. Our shoveling work, initiated at Seoksu market and carried on to the Anyang River via the Manan Bridge in 2008 has several aims. It is intended to dig out the history of our long accumulated lives, to incorporate a wide variety of artistic experiments, to open the flow of a pool of water, to break down the dam between art and life and the boundary formed by our existing habits and customs, and to demolish institutionalized dignity. This shovel is also an attempt to build up a trench for a new cultural and artistic movement.